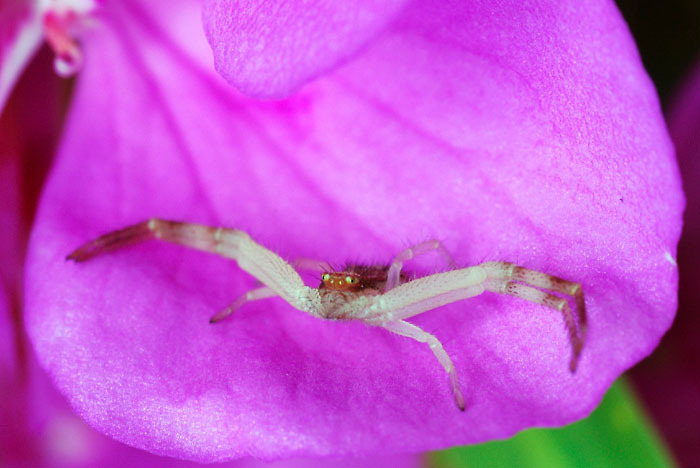 I was stooping over to take a closer look at a geranium that sits on our deck yesterday (a ''duplex-warming'' gift from a friend of Weez's) and noticed this spider perched on the end of one of the petals. What caught my attention first and held it was the size of the fore legs and the way they were spread out in a ''ready to embrace'' manner. Woe be to the unsuspecting bee or other insect that finds itself the recipient of the waiting hug . . .